Okay, so I haven’t had enough time to review Bleach the past couple of weeks (months even). Apparently I’m a busy, busy man. But not today! (Actually, I’m still swamped, but meh…) A new challenge awaits me today. Going over six chapters in a single review with a three hour time limit while being as rusty as can be due to the seven week “break” I’ve had! What could possibly go wrong? I’ll also have to limit myself to one page per chapter, if I’m to wrap this review up in time… Here I go!! !… wait, my shoe’s untied… ah, that’s right, I don’t even have feet! Yamamoto Genryuusai unleashed his Bankai. He revealed to be a better GPS system than Apple can provide as he certainly knows his east from west. The chapter started with Juha remembering his previous encounter with Zanka no Tachi after his right hand man comments on the Bankai’s form. Though the blade looks like it’s about to turn to ashes, Juha knows that this Bankai has more of a sizzle than a bang. 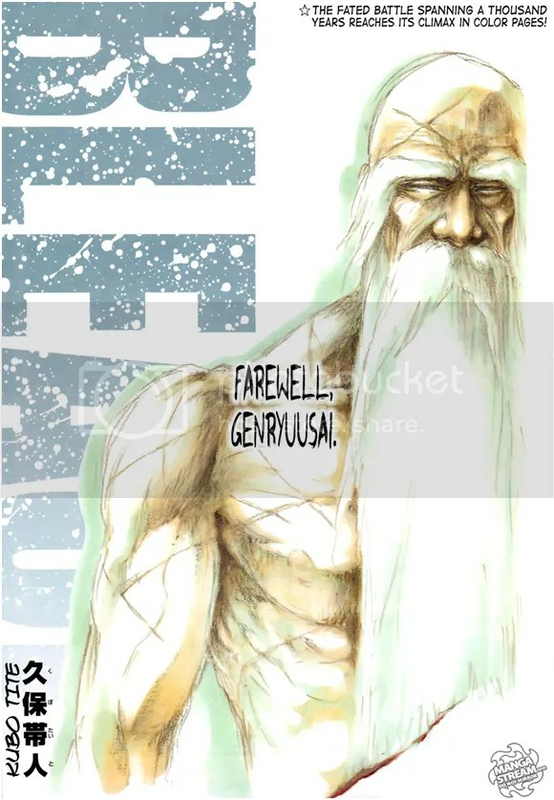 Soul Society itself is affected by Zanka no Tachi’s release. Just the release of the old man’s Bankai is enough to cause an instantaneous dry spell. Not even Daiguren Hyourinmaru can maintain its form, in spite of it being the most powerful ice/water type Zanpakutou! 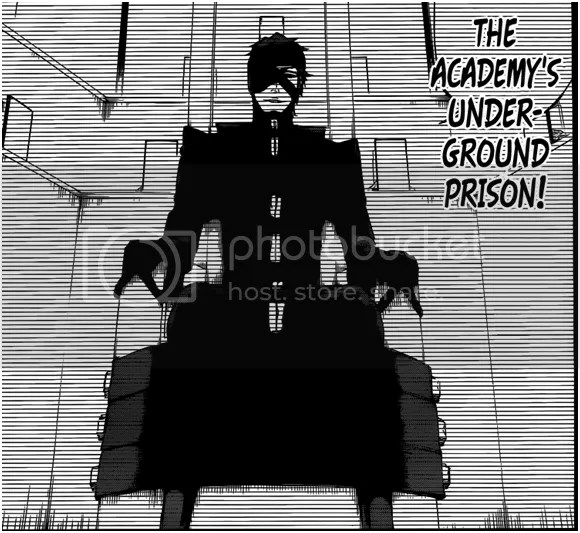 At least now we know why Genryuusai didn’t use his Bankai against Aizen while in the real world. Zanka no Tachi would’ve affected the climate within fake Karakura town and beyond. Juha then thinks himself to be smart by just trying to avoid the edge and attacking Genryuusai directly. But as Juha tries to cut Genryuusai, his blade suddenly just vanished. 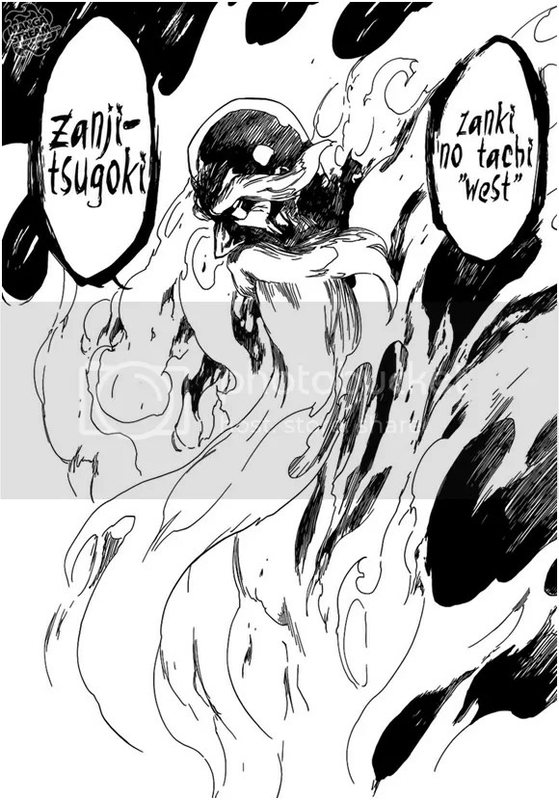 Genryuusai then points out that if there’s an East, there’s also going to be a West: Zanji Tsugoki. This second ability turns Genryuusai into a friggin sun! Nothing. This chapter was excellent. The flames surrounding Genryuusai as he used his Zanji Tsugoki… it even beat the moment where Franky used his laser in One Piece! It’s odd to see how all the captains know of Genryuusai’s Bankai. For something that’s supposed to stay as secretive as possible there are quite a few people who know exactly what’s what. You think Wonderweiss could’ve handled Zanka no Tachi? Genryuusai is on fire! He summoned an army of corpses, consisting of people he’s killed over the years! Juha Bach’s goose is cooked! Juha’s right hand man thinks that Genryuusai’s bluffing with his 15.000.000 degree coating. But he soon realizes that it’s far from a bluff. Juha knows even better. Were it not for his Blut ability, Genryuusai would’ve already burnt him to a crisp. 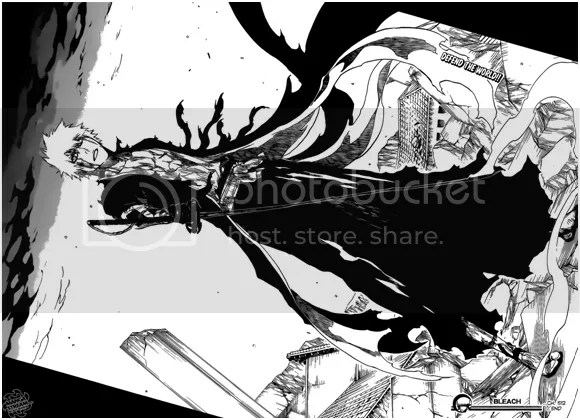 Genryuusai then reveals that his Bankai released more than just the most powerful Zanpakutou around. It released Genryuusai’s vindictiveness as well. Genryuusai mocks Juha for not being able to do anything. Heck, he even offers the man the opportunity to flee… only to be chased down and captured (Did Genryuusai look awesome as he told Juha that, or what?). Though Juha wanted to wet his pants after Genryuusai told him this, he probably realized all fluids would already be evaporated. So instead he tries using his arrows. Genryuusai isn’t impressed at all. Juha then resorts to the ultimate defensive Quincy technique (as far as we know): Kirchenlied Sankt Zwinger. Creating an area where anyone who dares enter is destroyed by light (lasers!). With Juha believing himself to be save, Genryuusai once more proves himself to be the superior. Besides the west side and the east side of it all, Genryuusai also has Zanka no Tachi South, Kaka Juumanokushi Daisoujin! This is an inferno I couldn’t even dream of imagining, so awesome . Content, really. For all the awesomeness this chapter brought us, it felt really short. The artwork in this chapter was just excellent. As we all know, Kubo knows his art. Though I may not know art, I know what I like. This chapter, I liked. (Also, friggin army of the BURNING dead! I could give props to Genryuusai two chapters in a row. Let’s face it, he kind of deserves it. But for now I’ll give Juha a bit of credit for trying his best with Kirchenlied. This friggin Bankai is so powerful that it can actually stop blood from flowing in Bleach… in Bleach! Genryuusai taunts Juha by using his own subordinates against him. After pointing out the reason for Juha not being able to capture Zanka no Tachi, the final of the four forms is released to kill Juha… who apologizes to himself? Juha is surprised (to say the least) at the sight of an army of the dead preparing to confront him. Genryuusai explains that Zanki no Tachi North, Kaka Juumanokushi Daisoujin gives his fallen victims another chance to taste blood. By giving live to the trillions of people Genryuusai has killed over the ages. Hearing this, Juha tries to mock Genryuusai for bringing the dead to life, even though he’s supposed to be a Shinigami. Not only that, it’s not even going to bother Juha to kill those who are already dead. Heck, he’s been doing it since he arrived in Soul Society the first time 1000 years ago. But Genryuusai then points out that Juha should look before he leaps. It turns out that Genryuusai summoned some old war buddies of Juha’s. Best of this reunion is that Juha has to kill them with his own hands this time. How cruel can Genryuusai get? Genryuusai then adds some fuel to the fire (as if this fire needs more fuel) by telling Juha he should’ve taken Zanka no Tachi away immediately. But then he points out that he probably couldn’t because he lacks information. Same goes for Tensa Zangetsu. Because Tensa Zangetsu can still evolve, the Vandenreich can’t measure Ichigo’s potential, making it impossible to make accurate estimates of what’s needed to capture his Bankai. With Genryuusai it’s the same, yet completely opposite. Same as Ichigo, Genryuusai’s limits are unknown. But in Genryuusai’s case it has to do with his vast experience battling and having refined his Bankai through the ages. 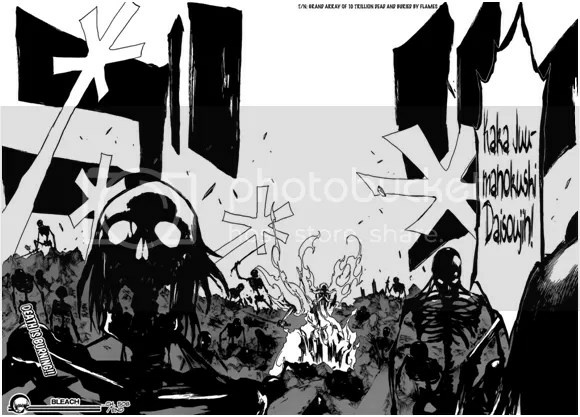 Juha then plows through the corpses of his former comrades, while cursing Genryuusai. Genryuusai on the other hand points out that the suffering Juha is going through is nothing compared to that of the Shinigami he has killed. With those words, Genryuusai releases Zanka no Tachi’s final technique: Zanka no Tachi North: Tenchi Kaijin. Gutting Juha Bach with a single blow, Genryuusai seals his Bankai once more. With the temperature dropping immediately, rain starts to fall. As Genryuusai’s age starts to show, Juha utters his final words of apology… to Juha Bach-sama! Sure, a burning Getsuga Tenshou is nice and all, but I was hoping that Tenchi Kaijin would be a bit more… I don’t know. Just more. The moment where Juha apologized. I was going out of my mind at that time. Genryuusai killed the boss, yet he didn’t? How’s this supposed to work out? Kubo Tite, hands down. He managed to give us Zanka no Tachi entirely in three chapters time, while wrapping it up with a troll for us all! How come there aren’t any Hollows amongst the dead in Kaka Juumanokushi Daisoujin? Could it be that the Hollows slain by Genryuusai take on their human form once summoned? Or did Genryuusai just opt to stick to the Quincy for now? Royd Lloyd posed as Juha Bach. Juha Bach went to visit Aizen! Genryuusai has been killed?! The chapter started with an explanation on Sternritter Y ‘The Yourself’. It turns out that Yourself wasn’t just himself, but rather himself and his brother. These brother Loyd and Royd had the ability to mimic others. Loyd could mimic looks and powers, while Royd could mimic looks and essence (memories and spirit). As Genryuusai hears Royd’s final words, he realizes something’s up. AIZEN!!! Juha wanted Aizen as a part of his special forces. Aizen declined and Juha left Aizen to rot for eternity. As if Aizen is going to rot away… Juha then asks Genryuusai whether he’s out of steam after fighting his fake. Genryuusai takes the bait as he calls forth his Bankai. But Juha easily takes Genryuusai’s Bankai away. Juha then explains that it wasn’t a matter of information that kept others from taking away his Bankai, but simple raw power. I wanted to see the scene with Aizen and Juha! 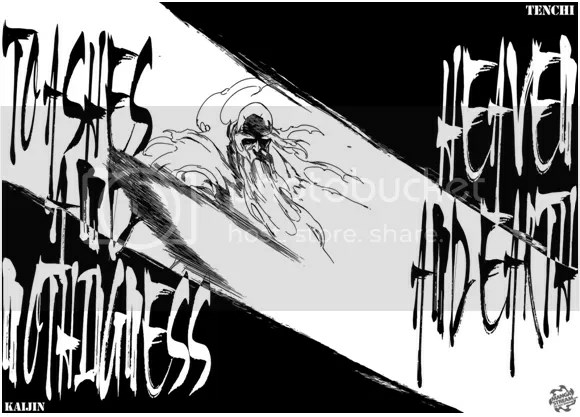 I loved the way Kubo integrated both ‘The Yourself’ from a couple of chapters ago along with Aizen into this chapter. Especially the Aizen part. Aizen, for choosing to stay seated for another couple of millennia rather than joining Juha. Aizen is going for Godhood or bust! Who says that Juha Bach is the real Juha Bach right now? For all we know Aizen just killed Juha and used his Bankai to make himself look like Juha! NOOOOO~~~~!!! Who is going to scold Kenpachi now? Genryuusai has been killed dead! Juha summons an army of Quincy to sweep clean the entirety of Soul Society! Juha wants to flee from the 0th division! The original Gotei 13 were shown (sort of)! The chapter started with a flashback to where Shunsui first got a hint of Genryuusai’s true face. A single picture decorated a private room of Genryuusai’s, which intrigued Shunsui. Genryuusai explains that it depicts a monster that once terrorized Soul Society during an age where Soul Society was at its low. Genryuusai then assures Shunsui that the monster would never show its face ever again. But if it would, it would probably mean that Genryuusai would never come back again. Genryuusai’s body suddenly falls in twine, with Ukitake and Shunsui sensing what happened to their teacher. Shunsui is distracted to the point where his opponent takes advantage of that situation. Juha looks down on Genryuusai, mocking him for his current state. He then tells his right hand man, Hashvald, that they’re leaving. But Genryuusai isn’t one to quit. Even with his legs still standing behind him, he uses his remaining limb to cling to Juha. Juha mercilessly cuts off Genryuusai’s right hand and then gives his eulogy. He tells Genryuusai never follows through with what he does. This is the reason why Juha didn’t consider Genryuusai as one of the five warring potentials. It was Genryuusai’s stubbornness that didn’t allow him to rely on others. He didn’t ask Orihime to heal his left arm, because he felt he shouldn’t. He reluctantly accepted Ichigo’s help, but Genryuusai felt he should be the one to shoulder everything. But (as was shown through the memory of Shunsui) Genryuusai would no longer do as he did in the past. In the past, the Gotei 13 were merciless thugs. Genryuusai and his merry band of outlaws got the job done, no matter the cost. But after things settled down, Genryuusai decided to follow the path of justice and pride. This is what prevented him from accepting help from the humans he had hurt in the past. Juha ends his eulogy with a display of lights and an order. As the (remaining) captains sense what happened to Genryuusai, the Sternritter summon their soldat. Shadows expand from the Sternritter, creating gateways from which countless soldiers emerge. Even though the members of the Gotei 13 think them to be mere cannon fodder, it turns out the Soldat have more up their sleeve than expected. Loyal readers saw this one coming from a mile away… KON! Everything. Another excellent chapter for Bleach. Chibi Shunsui has won this one. He really hasn’t changed at all, has he? Also, is it me, or are the Sternritter displaying more Fullbring abilities than Quincy abilities? Akon showed some real cojones, Jaz wears leopard print, Renji and Rukia are still alive, Byakuya speaks his final words, and Ichigo is about to strike back! Akon managed to open the Garganta on the Soul Society end, with some complications. No sooner does he greet his guest, or he falls at the hands of Jaz Domino, one of the Sternritter. Even though he uses dagger-like totems, we will never know what his true ability is. That’s because the person he’s talking to doesn’t care. With an eruption of power in the sky, the captains and vice-captains look up. We see Ichigo checking up on Renji and Rukia, only to quickly move away. The Sternritter did notice Ichigo’s appearance, but all of a sudden they can’t track his Reiatsu. Ichigo then arrives at one of his closest friends in Soul Society: Kuchiki Byakuya. Hashvalt and Juha sensed Ichigo’s Reiatsu. Though Hashvalt offers to take down Ichigo, Juha seems to be reluctant. It almost seems like Juha has a personal reason to leave Ichigo out of this matter. But whatever the case, Juha has no choice in the matter. Just as he tries to leave, Tensa Zangetsu comes flying in. Juha curses the person who threw the blade, being none other than Ichigo who is ready to keep his promise to Byakuya. I would’ve loved to get a hint as to how Ichigo got out of the prison. Sure, he looks torn up, meaning he probably used an attack of sorts that did damage to the point where it would hurt himself, but that doesn’t give any answers. The moment Tensa Zangetsu came in flying. How awesome is it that Ichigo manages to throw Zangetsu that close to his opponent in such a threatening manner. It actually startled Juha and everything. I could mention Ichigo or Byakuya here, but credit’s going where credit’s do. Akon has proven himself to be more reliable that anyone’s ever given him credit for. He gave his all to get Ichigo to Soul Society at the moment Soul Society needed him most. Great job Akon! You’d think that during the entire time where Byakuya was ‘dying’, a fourth division member would’ve been able to give him some much needed first aid. Jaz Domino says something about getting his powers bestowed upon him. A hint that he’s actually a Fullbringer, or perhaps a sign that Juha has the means to give anyone Quincy powers? Next week we’ll learn how Ichigo managed to escape from his prison in the Garganta. Most likely with some information on the person who held a blade to Urahara. 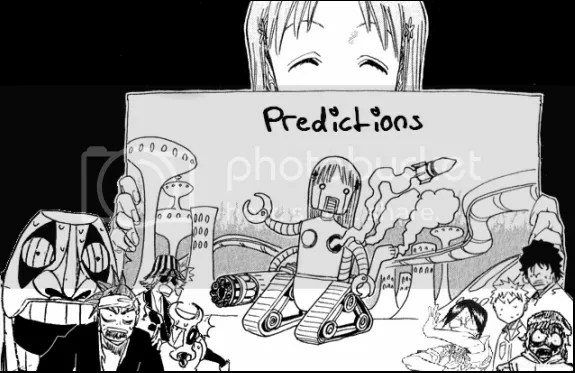 Urahara, Chad, and Orihime will probably make their way to Soul Society as well, along with the mystery person. By the end of the chapter, Ichigo will want to fight Juha, only for Hashval to take matters into his own hands. ~ by The Underscore on October 21, 2012. Thanks for sharing the marathon review! Yeah, the thing I’m really stumped about is who’s behind the blade pointed at Urahara. I’m still thinking it’s Ryuuken, who I expect to be one of the 5 special potentials. He’s one of the only characters for whom we don’t know the extent of his powers (Urahara being another). Also, did Ichigo kill Daz in Hueco Mundo or Soul Society? If it’s Hueco Mundo, when did another Sternritter arrive there? The first few frames of the latest issue really confused me. Review overdose! …the kind that’ll need another run next week >=D Anyway, nice job, interesting setup. Ichigo is going to be judge, jury and executioner of the crime, unless Bach go all dictator on him. But I guess now it’s time for Hashie to shine and fall. See your review next week! Or month! A year? Okay, can even wait till a millenia!